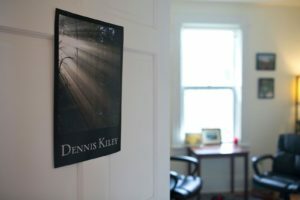 Dennis Kiley is a psychotherapist who along with his private practice also works as a counselor at the College of the Atlantic. His particular area of focus is using mindfulness in his work with adults, both individuals and couples. Dennis looks at the mind-body connection as part of a larger holistic approach. He compassionately meets each person where they are at, holding space for their unique values, goals and experiences. Working relationally, Dennis uses awareness to foster healing and understanding about what each client is needing as well as what isn’t working for them. His primary areas of focus are relationships, life transitions, men, anxiety, depression, substances and spirituality. Dennis has a bachelor’s degree in psychology from Bowdoin College. 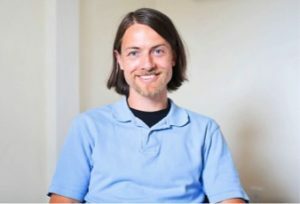 He attended the California Institute of Integral Studies where he received his master’s degree in counseling psychology; his particular focus on an integral and transpersonal approach to psychotherapy. In addition to being a therapist, Dennis also teaches yoga and meditation, leads a men’s circle, and facilitates groups and workshops. He serves on the board of several local organizations including A Climate To Thrive and the Northeast Guild for Spiritual Formation. His particular passion is for the field of ecopsychology, and he is the founder of the EcoPsychology Initiative. After several great years living in San Francisco, he is happy to be back home on the Island. Dennis and his wife, Johannah Blackman, are grateful to be raising their young daughter, Gwinna, in such a beautiful place and within such a great community as MDI. Dennis works on a sliding fee scale with a standard rate of $75 for 50 minutes.